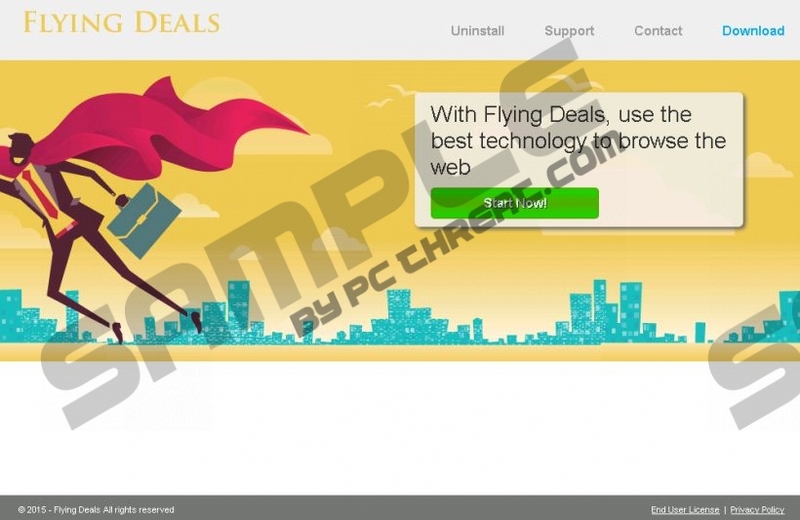 Flying Deals is yet another adware application recently released by the SuperWeb LLC. It has all the same traits its predecessors have, so it is definitely an unreliable application you could do without. Therefore, we are of the opinion that you should remove this infection from your computer before it causes damage to it. It is difficult to say with what your PC might end up getting infected with, we can only speculate that is could be anything from adware and browser hijackers to ransomware and fake anti-malware scanners. There is no reason for this infection to remain on your computer, so you can remove it without any hesitation. As mentioned, Flying Deals is very similar to its predecessors, such as Metal Maker, Special Box, Ski Search, and so on. Thus, you should also remove these infections if your computer happens to be infected with any of them. This and other similar infections are only susceptible to Firefox an Internet Explorer, since the newest version of Chrome blocks them. Flying Deals displays various commercial advertisements, such as pop-ups, in-texts, coupons, and so on. The main reason why you should remove this application is, because it could display unreliable ads created by shady advertisers. The developers at SuperWeb are apt to enter into an agreement with various shady entities, because they can make a profit by utilizing the pay-per-click system. But in order to cash in, the user must click the ad. Therefore, the developers gather information about the user’s browsing habits to adjust their marketing campaign by tailoring ads to unique users. However, the promoted ads are also likely to be misleading, so users should be wary of “great deals” offering to enter your banking credentials or downloading a free antimalware scanner. Flying Deals utilizes bundling as its main vehicle of distribution. This app can often be found on freeware bundles on websites such as Brothersoft.com, Softonic.com, and so on. Even though Flying Deals has its own dedicated website at Bestflyingdeals.com, you cannot download it from there, and it’s a good thing too, because the consequences may be severe. all in all, it is clear that Flying Deals is a useless piece of software that only serves the interests of its developers and on you. The content promoted by this application could be misleading, so you could be scammed by unreliable retailers or get infected with malicious apps. Therefore, we recommend that you remove Flying Deals ASAP. Find Flying Deals and click Uninstall. Quick & tested solution for Flying Deals removal.